BATON ROUGE, La. -- Ten people are facing hazing charges in the death of a Louisiana State University fraternity pledge after a night of drinking last month. 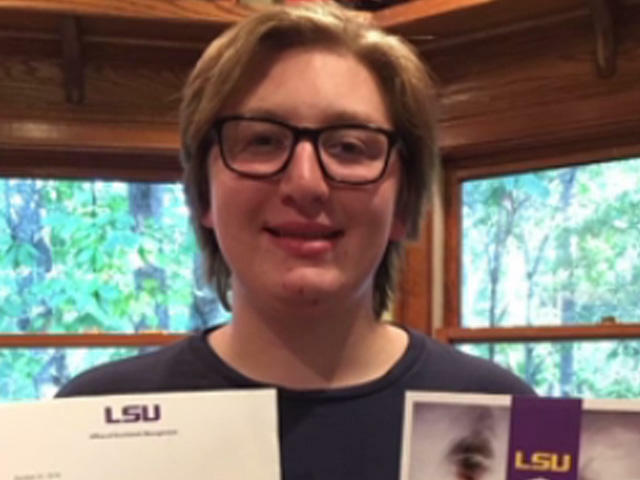 The LSU Police Department said in a statement on Wednesday that one of the 10 suspects -- 19-year-old Matthew Alexander Naquin of Boerne, Texas -- also faces a negligent homicide charge in the death of 18-year-old Maxwell Gruver, a freshman from Roswell, Georgia. An autopsy found that Gruver's blood-alcohol level was .495 at the time of his death, more than six times the legal limit for driving, the East Baton Rouge Parish Coroner confirmed. LSU spokesman Ernie Ballard says eight of the suspects are LSU students and were active members of the fraternity. They are Naquin, 18-year-old Ryan Isto, 21-year-old Sean Pennison, 19-year-old Hudson Kirkpatrick, 20-year-old Elliott Eaton, 19-year-old Nicholas Taulli, 19-year-old Zachary Castillo and 21-year-old Zachary Hall. The two others are Patrick Forde, 20, and Sean-Paul Gott, 21. Gott was previously enrolled at LSU, Ballard told Crimesider. He said all 10 turned themselves in to LSU police on Wednesday. The hazing charges against all 10 suspects are misdemeanors that carry sentences of 10 to 30 days in jail and a mandatory expulsion from the university. LSU may opt to expel students on their own before criminal proceedings begin, reports CBS affiliate WAFB. Negligent homicide is a felony that carries a maximum sentence of five years. The fraternity's national office said it closed the chapter after Gruver's death. Gruver died at a hospital on Sept. 14 after Phi Delta Theta members found him lying on a couch at the fraternity house. A witness told police that Gruver was "highly intoxicated" when fraternity members laid him on the couch and left the house sometime early that morning. Around 11 a.m., members found Gruver still on the couch with a weak pulse and couldn't tell if he was breathing, police said. Two people drove him to a hospital, where he died that day. A coroner said hospital tests found a "highly elevated" blood-alcohol level in Gruver's body. The cause of death was listed as acute alcohol intoxication with aspiration. The death was ruled an accident. Police reports suggest Gruver was forced to drink to excess during a game or initiation ritual called "Bible Study" on the night before his death. Pledges were forced to drink if they incorrectly answered questions about the fraternity, according to arrest warrants filed by the East Baton Rouge Parish Sheriff's Office. An arrest warrant says several pledges told investigators they received a message or phone call from Gott, then a fraternity member, on Sept. 13 telling them there would be "Bible Study" at the fraternity house at 10 p.m. Around 9:30, about 18 to 20 pledges showed up, and Pennison -- also a fraternity member -- took their cell phones, the warrant says. The pledges were told to get a Solo cup of lemonade to use as "chaser." Fraternity members Naquin, Gott, and Isto, along with former member Forde, came downstairs, and Naquin yelled, "Are you ready for Bible Study?" and "Y'all better do well, I'm already f----ed up." The pledges were ordered to go upstairs while Gott threw hot sauce and mustard on them, the warrant says. The pledges were told to line up in the hallway and place their nose and toes against the wall. The lights were off, with a strobe light flashing and loud music playing, the warrant says. The pledges were then asked questions by fraternity members and if they answered incorrectly, were made to take "pulls" of 190-proof Diesel liquor. They were also told to do "wall sits" and "planks," the warrant says. Pledges told investigators several fraternity members were upstairs, but the main members doing the hazing were Naquin, Gott and Isto, and most people interviewed said Naquin was the most aggressive, according to the warrant. One member said Naquin was yelling and forcing the pledges to drink Diesel by taking the "pulls." The member said at one point he told Naquin and Gott to "cut it out" because he felt it was getting out of hand. Another member said Naquin would force Gruver to recite the Greek alphabet and force him to drink each time he messed up. One pledge told investigators he believed Naquin and Gott were singling out Gruver more than the others because Gruver was frequently late for events. Another pledge said Naquin was yelling at Gruver more and felt that Naquin didn't like Gruver, according to the warrant. The pledge said Naquin told him several days before he wanted to "cut" Gruver from the pledge process. Another pledge who was next to Gruver during the hazing said Gruver was made to take at least 10 to 12 "pulls" of Diesel, the warrant says, while other pledges said they took three to four at most. Several witnesses said Gruver was downstairs and passed out on the couch my midnight. The next day, he was dead. Police executed search warrants at the fraternity house and at Gruver's dorm room. Among the items seized from the fraternity house were a duffel bag filled with beer cans, bottles of liquor, a glass smoking pipe, a "pledge test," cleaning supplies and two strands of white knotted rope, according to a search warrant return. Police also found devices that may have captured video footage inside the fraternity house "during the times of the events," a police affidavit says. "Investigators also learned that there were several text messages sent about (Gruver's) condition," the affidavit said. Police also obtained a warrant to examine Gruver's phone so they could see who he called or texted before his death. Louisiana Gov. John Bel Edwards asked leaders of the state's higher-education system to review their campus policies on hazing, alcohol and drugs following Gruver's death. "One loss of life to hazing or drug and alcohol abuse is too many, and I know that you share my very serious concerns," Edwards wrote in a letter dated Sept. 21, asking them to report their findings and recommendations to his office by Oct. 29. LSU Police said in a statement they've been in touch with the Gruver family throughout the investigation and regarding the arrests. The statement says the school has formed a task force on Greek Life to review overall governance and oversight of Greek organizations. "Today's arrests underscore that the ramifications of hazing can be devastating," LSU President F. King Alexander said in a statement. "Maxwell Gruver's family will mourn his loss for the rest of their lives, and several other students are now facing serious consequences – all due to a series of poor decisions." John McLindon, a lawyer for Naquin, declined to comment on the charges against client "out of respect for (Gruver's) family." McLindon said he hasn't seen any police reports and doesn't know why his client is the only suspect facing a charge of negligent homicide. "Let's just wait until the evidence comes in," he said. Hall's attorney, David Bourland, said his 21-year-old client didn't participate in hazing activities or provide anyone with alcohol on the night before Gruver died. Hall, a junior who lived at the fraternity house, is in a "deep depression" over his friend's death, his attorney said. "But my client did not violate any law or code of conduct at LSU," Bourland added. "He did not do anything that could have contributed to this unfortunate, tragic accident." East Baton Rouge District Attorney Hillar Moore said his office will present evidence to a grand jury and could seek additional charges against some of the 10 suspects. Other individuals also could face charges in the case, Moore added.